Total Head: Up to 473 mtrs. Flow Rate: Up to 1400 lpm. Total Head: Up to 435 mtrs. Flow Rate: Up to 100 lpm. Total Head: Up to 153 mtrs. Total Head: Up to 280 mtrs. Flow Rate: Up to 180 lpm. Flow Rate: Up to 740 lpm. Total Head: Up to 218 mtrs. Total Head: Up to 368 mtrs. Flow Rate: Up to 770 lpm. More than 250nos. of models are having ISI mark. Suitable in wide voltage variation with greater performance even in low voltage. Winding wire with high quality insulation to avoid chance of winding burn even in low or high voltage working. Whole range is with EC grade Copper brazed rotor having chrome plating for years of trouble free commissioning. Fully Stainless steel shaft hence no chance of corrosion. Very low maintenance due to high quality carbon Vs steel combinationof thrust bearing with leaded tin bronze made bush bearing. Shaft & bushes are having mirror surface finish achieved by auto burnishing machine for very long life. Diffuser Bowls and impellers are made of virgin PPO matrerial for best wear resistance & strength for long maintenance free service and consistency in performance. All rotating parts are dynamically balanced for low noise and longe bush bearing life. Diffuser Bowls are having stailess steel neck rings giving best wear resistance and long life. Motor body with stator varnihed by vacuum impregnated plant to resist against corrosion & excessive heat in case. Mounting parameters and spline coupling are as per international NEMA standard. Improved hydraulic design with incresed efficiency and reduced power consumption. Specially designed range of pumpsets which is more suitable for sandy water areas. Built in NRV with minimum losses to avoid water hammering & clogging due to send while switching off pump set. Internal surfaces of the all parts are protected from rusting with special coating for longer life. Better outer aesthetics with durable paint protection. 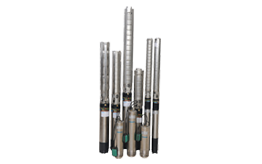 Pump & Motor are packed with adequate fitments to avoid damage while reach to end user. All components are machined on CNC machines with very close tolerances which reduces noise,vibrationd,wearing,current , heat ultimately product life. All fastness are used of stainless steel only for easy maintenance & very long life. Easily rewind able motor and fast maintenance with easily interchangeable spare parts. Higher efficiency which gives result into high water discharge at low power consumption. Drinking water needs in cities and villages. Waterworks, private households and small farms. Cooling & pressure boosting system in industrial application. Water supply for dairies, breweries and mineral water bottling and pouch plants. Irrigation -open , drip or sprinkling system in gardening, agriculture ,forestry as for fist ponds. It is our policy to deliver products & services that satisfy the present & future requirements of our customers. We shall ensure that the customer receives the product as per agreed Quality, at the agreed time and in the agreed quantity. The Quality assurance system of the company shall meet all the relevnt requirements of ISO 9001-2008.